View More In Exercise Balls & Accessories. PF Solutions The Loop - Save floor space! Mount ANY size inflatable fitness ball anywhere you want. 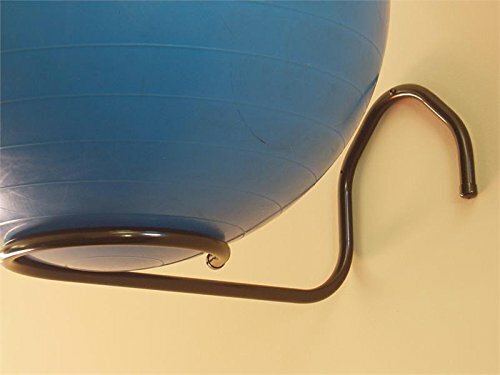 Long arm extension will keep even the largest exercise balls from touching the wall, preventing body oils, dirt from the floor, and sweat from leaving stains on the walls. Great for studios or large gyms. Mount them close together OR have a ball handy anywhere in the gym!. Simple to mount. Choose wall bracket positioning up or down depending on your space requirements. Sturdy steel construction holds up to 15 lbs in hollow walls, even without finding a stud. Durable powder coat textured finish. Available in Black Texture (or) hammertone Silver Vein color finish. Also holds bands, cones, hurdles, ropes, and other lightweight accessories. Balls not included. Available in hammertone Silver Vein or Black Textured Finish (see close-up picture detail).